Draft: 2004, Philadelphia Phillies, 3rd rd. James Anthony (J.A.) Happ... Name pronounced Jay...Graduate of St. Bede High School in Chicago... Earned team MVP in his senior season and was named Bureau County Athlete of the Year... Was a four year letter winner in baseball and basketball ...Averaged 22 points in his senior year in basketball and is all-time leading scorer in St. Bede history... Attended Northwestern for three seasons... Became first Wildcat in history to be named All-Big-Ten in three straight seasons...Led the Big-Ten in ERA (2.68) and strikeouts (106) in his senior season. Combined to go 17-6 with a 3.65 ERA (177.2IP, 150H, 81R/72ER, 51BB, 193K, 27HR) in 31 starts between the Blue Jays and Yankees…held opponents to a .225 BA (150-for-668, 27HR); LH .171 (22-for-129, 2HR), RH .237 (128- for-539, 25HR)…his teams were 21-10 in his starts…posted a 3.2 WAR and 3.98 FIP (FanGraphs)…made his ninth Opening Day roster...According to STATS, was the fourth pitcher to make starts for both the Yankees and Blue Jays in the same season, and the first since David Cone in 1995...Tied for fourth in the AL (and tied for seventh in the Majors) in wins…posted the second-highest win total of his career (20-4 in 2016)...Set career highs in strikeouts, K/9.0IP ratio (9.78) and strikeout rate (26.3%)…finished eighth in the AL in K/9.0IP ratio…had a season-high 10K twice, on 4/24 vs. Boston and 5/16 at the Mets...His .171 opponents' BA vs. left-handed batters was the Majors' fourth-lowest mark by a starting pitcher...Made his first career All-Star Game, selected by MLB as Toronto's lone representative…pitched the 10th and earned the save in the AL's 8-6 win despite allowing a solo HR to Joey Votto (1.0IP, 1H, 1ER, 1K)…at the age of 35, was the fourth-oldest player in the game behind Nelson Cruz (38), Shin-Soo Choo (36) and Yadier Molina (35)...Was 10-6 with a 4.18 ERA (114.0IP, 53ER) in 20 starts with Toronto...Was acquired by the Yankees from the Blue Jays in exchange for INF Brandon Drury and OF Billy McKinney on 7/26...Made 11 starts with the Yankees, going 7-0 with a 2.69 ERA (63.2IP, 51H, 20R/19ER, 16BB, 63K, 10HR)…was the third pitcher in Yankees history to go 7-0 or better in a season, joining Tom Zachary (12-0 in 1929) and Aaron Small (10-0 in 2005)…the Yankees were 9-2 in his starts…tied for sixth in the Majors in wins from the day of his Yankees debut on 7/29 through the end of the season, one of two pitchers at 7-0 or better in that span (Tampa Bay's Blake Snell, 9-0)…held opponents to a .143 BA (6-for-42) with RISP as a Yankee...Won his first five starts as a Yankee (7/29-8/25), the first Yankees pitcher since Bob Turley in 1955 to both start and win each of his first five appearances as a Yankee according to the Elias Sports Bureau…was the first Yankee to win his first five starts with the club since Rob Gardner, who had relief appearances mixed in among his first five Yankees starts stretching from 1970-72…was the first Yankee to go undefeated in his first 12 starts with the club since Joe Cowley (8-0 in 12 starts from 7/16/84-4/23/85)…was the first pitcher to win his first seven decisions as a Yankee since Dellin Betances started his career 9-0 from 2011-15...Finished the season on a 12-start unbeaten streak (since 7/22, including his final start with Toronto)…was tied for the Majors' fourth-longest active streak of unbeaten starts as of the end of the 2018 season…was tied for the second-longest unbeaten streak of his career (15 straight starts from 7/4/08-7/19/09)...Was placed on the 10-day disabled list on 8/2 (retroactive to 7/30) with hand, foot and mouth disease…was reinstated on 8/9...Tied for second in the Majors in home wins, going 10-4 with a 4.31 ERA (108.2IP, 52ER) in 19 starts…was 4-0 with a 2.72 ERA (39.2IP, 12ER) in seven home starts as a Yankee…went 6-4 with a 5.22 ERA (69.0IP, 40ER) in 12 home starts with Toronto...Was 7-2 with a 2.61 ERA (69.0IP, 20ER) in 12 road starts overall…went 3-0 with a 2.63 ERA (24.0IP, 7ER) in four road starts with the Yankees…was 11-2 with a 2.65 ERA (108.2IP, 32ER) in 19 starts outside of Rogers Centre...Opponents batted .160 (15-for-94) in at-bats ending in a slider and .203 (71-for-350) in at-bats ending with a four-seam fastball (Brooks Baseball)...Made his first career Opening Day start on 3/29 vs. the Yankees (L, 4.2IP, 4H, 3R/2ER, 1BB, 5K, 1HR)…according to the YES Network, was the second pitcher ever to start against the Yankees on Opening Day and later pitch for the club in the same season…on 4/23/1919, Carl Mays tossed a four-hit shutout for Boston at the Polo Grounds, then was traded to the Yankees on 7/30/1919…Mays, however, did not start for the Yankees against his former club that season...In 5/16 win at the Mets, went 2-for-3 with 2R and 1BB at the plate, becoming the first pitcher in Blue Jays history to reach base safely three times in a game…was the third multi-hit game by a pitcher in franchise history (Roy Halladay, Drew Hutchison)…tied Halladay's club record for runs scored by a pitcher…also allowed just 2H over 7.0 scoreless innings (0BB, 10K), becoming the first AL pitcher to record at least as many hits as his opponent while tossing at least 7.0IP since California's Clyde Wright on 9/14/72 vs. Texas...Earned his 100th career win on 6/8 vs. Baltimore...Made his Yankees debut on 7/29 vs. Kansas City, starting and earning the win (6.0IP, 1ER)...In 8/14 win vs. Tampa Bay allowed 1H over 7.0 scoreless innings (4BB, 4K, 1HP)…was the first Yankee to throw at least 7.0 scoreless frames with one-or-zero hits since Michael Pineda on 9/22/14 vs. Baltimore (7.1IP, 1H, 0R)…marked his first career start with at least 7.0IP and 1H-or-fewer...Made one postseason start, taking the loss in ALDS Game 1 at Boston (2.0IP, 4H, 5ER, 1BB, 2K, 1HR)…was on the roster for the Yankees' AL Wild Card Game win vs. Oakland but did not pitch...Went 1-1 with a 3.05 ERA (20.2IP, 7ER) in six spring training starts with Toronto. Allowed 1 ER or fewer in 12 of 25 starts, including five of his last six games ... Allowed 2 ER or less in 16 starts ... Over his last 12 starts, gave up just three home runs ... In nine starts vs. AL East teams, posted a 2.21 ERA (13 ER/53.0 IP) and a .219 opponents' average ... Held a .198 opp. avg. against left-handed hitters which ranked 6th among LHPs in the AL ... Struck out nine batters over 7.0 innings in his season debut on April 5 at BAL, the 3rd time in his career with 9+ strikeouts and no walks ... Did not walk a batter while recording eight strikeouts in his second start on April 11 vs. MIL ... Left in the 5th inning with tightness in his left elbow on April 16 vs. BAL ... Placed on the DL from April 18-May 29 with left elbow inflammation ... Picked up his 1st win of 2017 with 6.0 scoreless innings on June 11 at SEA ... Allowed a season-high 7ER and 9H on July 23 at CLE ... Struck out 10 batters on Aug. 2 at CWS, the 7th 10+ strikeout effort of his career (4th as a Blue Jay) ... Picked up his 500th strikeout as a Blue Jay on Aug. 8 vs. NYY (Gregorius) and improved to 8-2 with a 3.51 ERA all-time as a starter vs. the Yankees ... Took the loss in a 7-4 defeat on Aug. 18 at CHC (approximately 1.5 hours from his hometown) while allowing a season-high nine hits over 5.0 innings... Had not pitched at Wrigley since 2012...The loss also ended a three-game win streak ... Had a homerless streak snapped at 39.2 innings as he gave up a home run in the 5th inninng on Aug. 30 vs. BOS to Hanley Ramirez ... Suffered his 11th loss (1-0) on Sept. 21 vs. KC, his second last outing, despite allowing just 1 ER over 6.2 innings ... Earned his 10th win on Sept. 26 at BOS (7.0IP, 4H, 1ER, 2BB, 9K), giving him 10+ wins in a season for the 6th time (3rd as a Blue Jay) ... Posted a 1.91 ERA (7 ER/37.2 IP) over his last six starts while allowing a .133 average with runners in scoring position. Suffered a skull fracture and sprained knee when struck by a ball off of the bat of Desmond Jennings on May 7 at TB... Missed three months primarily due to the knee injury. Pitched six or more innings in five of his 18 starts. Used 18.6 pitches per inning, the most on the staff and 2nd most in the majors...Only Lucas Harrell of the Astros used more at 18.7. Following his return from his skull fracture/sprained knee, posted a 4.37 ERA (59.2IP/29ER) in 11 starts. Had reverse splits in 2013, allowing left-handed hitters to bat .304 against him while righties hit .229. Since joining the Blue Jays in July 2012, has made 24 starts, going 8-9 with a 4.57 ERA, averaging just under 5.1 innings per start, although has registered a rate of 8.3 strikeouts per nine innings. Made five rehab starts prior to his return on August 7, one in the GCL (rookie), one in Dunedin (A) and three in Buffalo (AAA)...In total was 0-2 with a 4.22 ERA (21.1IP, 21H, 10ER, 8BB, 20K). 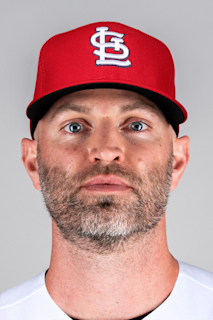 Combined to go 10-11 with a 4.79 ERA in 28 games, including 24 starts between Houston and Toronto... Won 10 or more games for the second time in his career... In his 28 starts, team was 13-15 and 3-3 as a Blue Jay... Posted 14 quality starts...Was acquired by Toronto from Houston on July 20 in a 10-player deal...Made four relief appearances for the Blue Jays after being acquired, posting a 5.14 ERA, despite holding opponents to a .200 average... As a starter with Toronto made six starts going 3-2 with a 4.59 ERA, holding the opposition to a .244 average...With Toronto struck out 46 batters in 40.1 innings for a 10.3 strikeout per nine total, becoming one of two Blue Jays pitchers to post a strikeout per nine total of more than 10 (min 40IP) along with Jason Frasor (10.92)...Performs much better after the All-Star break, going 4-2 with a 4.05 ERA as opposed to 6-9 with a 5.14 ERA prior to the break... In his career is now 19-14 with a 3.80 ERA prior to the break and 16-21 with a 4.55 ERA after...Posted a career high with 144 strikeouts... On Aug. 17 vs. TEX recorded six consecutive strikeouts... The mark tied a Blue Jays record done twice previously by Ted Lilly in 2004 and Mark Rzepczynski in 2010... Posted 10 strikeouts on May 27 at LAD, matching a career high...In his final start with Toronto fanned nine Orioles on Sept. 3...Had his season end prematurely with a right foot fracture and had surgery following his Sept. 3 start. Set career highs in starts and strikeouts (134) after beginning the season as the Astros fourth starter...spent most of theseason with the Astros but missed three turns in the rotation after being optioned to Triple A OKC from Aug. 6-24...after hisreturn, went 2-1 with a 2.43 ERA (10ER/37IP), while recording quality starts in five of six outings...allowed only a .175 (22x126)opponent's batting average in that time span....prior to being optioned, went 4-14 with a 6.26 ERA (83ER/119.1IP) in 22 starts...had three months this season with sub-4.00 ERAs (May, Aug., Sept.) and three with plus-6.00 marks (April, June, July)...hit .389(7x18) with one home run and four RBI in his first 11 games from April 5-May, 29...entered this season with four career hits in77 at-bats for an .052 avg...in his three turns in the rotation at OKC, went 1-0 with a 1.50 ERA (3ER/18IP) with 16 strikeouts in18 innings. Made 13 starts for Houston, posting a 5-4 record and a 3.75 ERA (30ER/72IP), after being acquired by the club fromPhiladelphia, along with OF Anthony Gose and SS Jonathan Villar, in exchange for RHP Roy Oswalt on July 29...had made threestarts for the Phillies from April 9-July 25, going 1-0 with a 1.76 ERA (3ER/15.1IP)...registered quality starts in nine of his 13 startsas an Astro...overall, allowed two runs-or-less in 11 of his 16 starts and three runs-or-less in 13 of his 16 starts...is 4-1 in eightcareer starts at Minute Maid Park with a 3.22 ERA (16ER/44.2IP)...prior to his last start of the season at the venue, on Oct. 2 vs.CHC (7ER/3IP), had owned a 4-0 record and a 1.94 ERA (9ER/41.2IP) in his previous seven starts at Minute Maid Park, and at thetime, was the only pitcher in ballpark history to start at least seven career games at the venue without recording a loss...that1.94 ERA ranked as the 3rd-lowest at MMP behind only Tim Lincecum (0.34 ERA) and Brandon Webb (1.48) (min. 25IP)...alloweda career-high-tying seven runs in 3.0 innings in his final start of the season on Oct. 2 vs. CHC...also allowed seven runs on Aug.4 at STL (1IP)...did not allow an earned run over two starts, 12.0 innings, from Sept. 21-26...recorded 10 strikeouts in those 12.0 innings...left-handed hitters hit .179 (12x67) against him this season, the 12th-lowest opponent batting average against leftiesamong all NL pitchers (min. 50 AB)...his two-hit, complete-game shutout on Aug. 30 vs. STL marked the first time an Astros LHPhurled a complete game allowing two hits-or-less since Bob Knepper had a one-hit, 1-0 shutout over ATL in the Astrodome onSept. 21, 1988...his win on Aug. 25 at PHI gave him victories against both clubs he's pitched for this season, becoming the 4thpitcher to accomplish this since 2005...he defeated the Astros, 8-0, on April 9 at Minute Maid Park... made his Astros debut onJuly 30 vs. MIL with 6.0 scoreless innings... became the 7th pitcher in Astros history to toss 6+ shutout innings in his teamdebut... marked the first time since Roger Clemens (7.0IP) did so on April 7, 2004 vs. SF in a 10-1 Astros victory... following hissecond start of the season, went on the DL on April 16 with a strained left forearm... did not make an appearance in May...began a rehab assignment on June 8 and made five rehab starts for Clearwater (A), Reading (AA) and Lehigh Valley (AAA)before being reinstated from the 15-day DL on July 6... optioned to Lehigh Valley that day and made three more starts beforerecalled by the Phillies on July 25... combined to go 1-2 with a 5.97 ERA (25ER/37.2IP) in nine games, eight starts, in the minorleagues this season. Winner of the Paul Owens Award as the best pitcher inthe Phillies minor league system...Began the season with Lehigh Valley (AAA) and had 3stints with the Phillies...Finished 2nd in the International League in SO (151)and 8th in ERA (3.60); had one fewer SO than the ILleader...Averaged 10.1 SO/9.0 IP...Had 4 double-digit SO games: 5/9 vs Columbus(13 SO), 6/5 at Indianapolis (10 SO), 7/3 vsScranton/Wilkes-Barre (12 SO) and 8/10 vs Buffalo(10 SO)...Allowed 3 ER or less in 18 of his 24 appearances...Recalled on 7/4 and made 2 starts (0-0, 3.27 ERA)before being optioned back to LV on 7/10...Pitched 7.0 no-hit innings (12 SO), 7/17 vsScranton/Wilkes-Barre, in the completion of asuspended game from 7/3...Recalled again on 7/29 and made 1 relief appearance(2.0 IP, 4 H, 4 R, 4 ER, 2 BB, SO) before being optionedback to LV on 8/8...Had his final recall on 9/1 and made 2 starts, bothagainst ATL (1-0, 1.42 ERA, .178 opp avg)...Earned his 1st ML win, 9/17 at ATL (6.0 IP, 3 H, BB, 2 SO)...Pitched at least 6.0 innings in 3 of his 4 ML starts...Went 1-0, 2.28 ERA in his 4 starts; 0-0, 7.88 ERA in 4relief appearances...Was hitless for the season: 0-for-10 in the minorleagues, 0-for-7 in the majors. Went to spring training with the Phillies as a non-roster invitee... Spent most of the season withOttawa (AAA)... Averaged 10.7 SO/9.0 IP through his first 6 starts (38 SO/32.0 IP)... Had his contractpurchased on 6/30 and made his ML debut that day in a start vs NYM (L, 4.0 IP, 7 H, 5 R, 5 ER, 2 BB, 5 SO)... Was optioned backto Ottawa following the game... Posted a 1.99 ERA (7 ER, 31.2 IP) and averaged 10.2 SO/9.0 IP (36 SO) over a 5-start span,7/29-8/20... Struck out a season-high 10 batters, 8/14 vs Pawtucket (6.0 IP)... Allowed 3 ER or less in 15 of his 24 starts... Did nothit a batter all season or allow more than 1 HR in any start. Began the season with Clearwater (A)...Had 2 career-best 10-SO games: 5/10 at Brevard County (8.0IP) and 6/6 at Lakeland (8.0 IP)...Selected as a Florida State League in-season all-star...Promotedto Reading (AA) on 6/30 and struck out 8 batters that night in his double-A debut (4.2 IP)...Collected his 1st professional hitand tied his career-high with 10 SO (5.2 IP), 7/13 vs Harrisburg...Named Phillies Minor League Pitcher of the Week, 7/17-23(2-0, 0.64 ERA) and was later named Phillies Minor League Pitcher of the Month for July (5-0, 1.93 ERA)...Had 5 consecutivewins, 7/5-29...Did not allow a HR through his first 11 starts with Reading (68.2 IP) ...Promoted to Scranton/Wilkes-Barre(AAA) on 9/4...Earned the win in his only triple-A start, 9/4 at Rochester (6.0 IP, 3 H, BB, 4 SO)...Participated in the ArizonaFall League...Rated the 8th-best prospect in the Phillies' minor league system by Baseball America. Began the season with Lakewood (A)...Named Phillies Minor League Pitcher of the Week twice: 5/9-15 and 8/29-9/4...Promoted to Reading (AA), 9/4, and pitched the final game of their season (W, 6.0 IP, 3 H, ER, 8 SO). Began his pro career with Batavia (A)...Had a season-best 7 SO in 3.0 IP, 8/23 vsAuburn...Earned his 1st pro win in his next start, 8/28 vs Auburn...Posted a 1.38 ERA in August...Pitched in the Florida Instructional League. December 17, 2018 New York Yankees signed free agent LHP J.A. Happ. October 29, 2018 LHP J.A. Happ elected free agency. August 9, 2018 New York Yankees activated LHP J.A. Happ from the 10-day disabled list. August 2, 2018 New York Yankees placed LHP J.A. Happ on the 10-day disabled list retroactive to July 30, 2018. Hand, foot, and mouth disease. July 28, 2018 New York Yankees activated LHP J.A. Happ. July 26, 2018 Toronto Blue Jays traded J.A. Happ to New York Yankees for LF Billy McKinney and 3B Brandon Drury. May 30, 2017 Toronto Blue Jays activated LHP J.A. Happ from the 10-day disabled list. May 25, 2017 Toronto Blue Jays sent LHP J.A. Happ on a rehab assignment to Dunedin Blue Jays. April 18, 2017 Toronto Blue Jays placed LHP J.A. Happ on the 10-day disabled list. October 6, 2016 Toronto Blue Jays activated LHP J.A. Happ. October 4, 2016 Toronto Blue Jays reassigned LHP J.A. Happ to the minor leagues. November 27, 2015 Toronto Blue Jays signed free agent LHP J.A. Happ. November 2, 2015 LHP J.A. Happ elected free agency. October 8, 2015 Pittsburgh Pirates activated LHP J.A. Happ. October 7, 2015 Pittsburgh Pirates reassigned LHP J.A. Happ to the minor leagues. August 1, 2015 Pittsburgh Pirates activated LHP J.A. Happ. July 31, 2015 Seattle Mariners traded LHP J.A. Happ to Pittsburgh Pirates for RHP Adrian Sampson. July 20, 2015 Seattle Mariners recalled LHP J.A. Happ from Bakersfield Blaze. July 9, 2015 Seattle Mariners optioned LHP J.A. Happ to Bakersfield Blaze. December 3, 2014 Seattle Mariners traded RF Michael Saunders to Toronto Blue Jays for LHP J.A. Happ. April 14, 2014 Toronto Blue Jays activated LHP J.A. Happ from the 15-day disabled list. April 10, 2014 Toronto Blue Jays sent LHP J.A. Happ on a rehab assignment to Buffalo Bisons. April 5, 2014 Toronto Blue Jays sent LHP J.A. Happ on a rehab assignment to Dunedin Blue Jays. August 16, 2013 Toronto Blue Jays activated LHP J.A. Happ from the bereavement list. August 13, 2013 Toronto Blue Jays placed LHP J.A. Happ on the bereavement list. August 5, 2013 Toronto Blue Jays activated LHP J.A. Happ from the 60-day disabled list. July 23, 2013 Toronto Blue Jays sent LHP J.A. Happ on a rehab assignment to Buffalo Bisons. July 18, 2013 Toronto Blue Jays sent LHP J.A. Happ on a rehab assignment to Dunedin Blue Jays. July 13, 2013 Toronto Blue Jays sent LHP J.A. Happ on a rehab assignment to GCL Blue Jays. May 24, 2013 Toronto Blue Jays transferred LHP J.A. Happ from the 15-day disabled list to the 60-day disabled list. May 8, 2013 Toronto Blue Jays placed LHP J.A. Happ on the 15-day disabled list. Head contusion. October 31, 2012 Toronto Blue Jays activated LHP J.A. Happ from the 60-day disabled list. September 24, 2012 Toronto Blue Jays transferred LHP J.A. Happ from the 15-day disabled list to the 60-day disabled list. September 7, 2012 Toronto Blue Jays placed LHP J.A. Happ on the 15-day disabled list retroactive to September 4, 2012. Fractured right foot. July 21, 2012 Toronto Blue Jays activated LHP J.A. Happ. August 25, 2011 Houston Astros recalled J.A. Happ from Oklahoma City RedHawks. August 6, 2011 Houston Astros optioned J.A. Happ to Oklahoma City RedHawks. July 25, 2010 Philadelphia Phillies recalled J.A. Happ from Lehigh Valley IronPigs. July 25, 2010 J.A. Happ roster status changed by Philadelphia Phillies. July 6, 2010 Philadelphia Phillies optioned J.A. Happ to Lehigh Valley IronPigs. July 6, 2010 J.A. Happ roster status changed by Lehigh Valley IronPigs. June 29, 2010 Reading Phillies sent LHP J.A. Happ on a rehab assignment to Lehigh Valley IronPigs. June 12, 2010 J.A. Happ assigned to Reading Phillies from Clearwater Threshers. June 8, 2010 J.A. Happ assigned to Clearwater Threshers. April 22, 2010 J.A. Happ roster status changed by Philadelphia Phillies.